I have been waiting to jump on to an opportunity to talk about our new THE FIZZ in Vienna and here I am with an “UPDATE”. Last Wednesday, me along with some colleagues had our first opportunity to visit the upcoming building for THE FIZZ Vienna Main Station (opening October 2019). I took the U-Bahn (subway) from near my house and there I was at Hauptbahnhof (Vienna Main Station), I exited the station and started walking towards our new building. It was overwhelming as the area is under vigorous development. I believe that it is one of the most up and coming neighbourhoods in Vienna! Within no time from exiting the main station, here I was standing in front of this tall fully erect structure with a organized chaos and the construction team hard at work. I wasted no time to rush to the site office and get my safety hat and jacket (Safety first, haha! ), after which I was following the site supervisor who showed us around. We entered the structure, still very crude but I could imagine how the lobby would look, bright and spacious with huge windows to have tons of natural light. I bet it will be a welcoming feeling every time you enter the lobby once it's complete. Soon, this will be your lobby with spacious lounges, common kitchen, movie area and so much more. Then, we moved on to view different room categories and features of the building - including a roof terrace. Each room just as the main lobby, is spacious and airy just like the whole building, which is designed to cater to every student’s need. Bright neutral colors bring the room to life along with a minor dark grey accent to give that boldness to the whole mood of that room. The color scheme and the furnishing so far look perfect, it makes me feel like moving out of my beautiful house, no jokes! I am really looking forward to the start of the viewings and house tours. THE FIZZ is based on a core value of always striving to be better and this new project is an accumulation of all the experience of the company developing the 9 existing micro-living and student housing solutions in the past 7 years. After living at THE FIZZ Vienna Brigittenau for almost one year, I guess I really am in a position to make a statement like that. The facilities and the plan of the new building are thought and talked about keeping in mind the 7 years of feedback given by our FIZZies. But let me tell you: These rooms are amazing! We will keep you posted with more news on VMS (Vienna Main Station)! Until then, check out our other blog post about THE FIZZ Vienna Main Station. 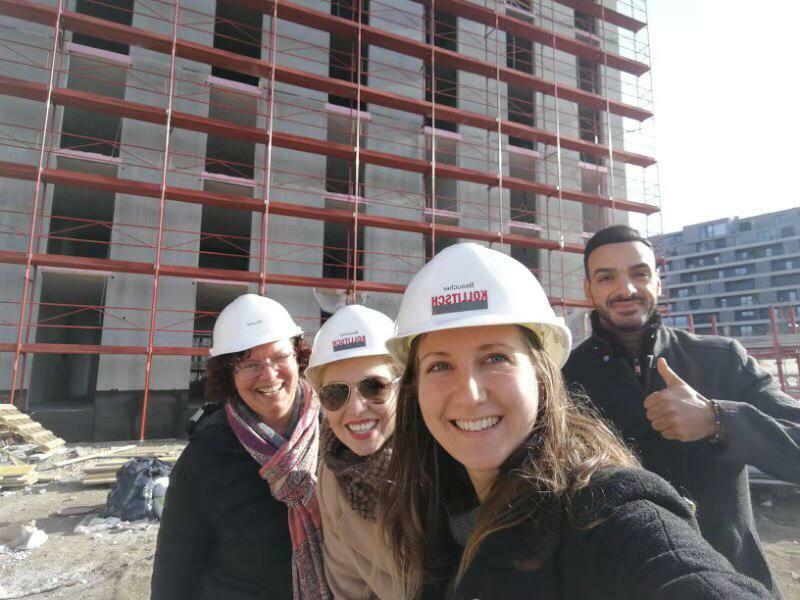 Project manager Sylvia and my sales teammates Diana, Naomi and Enis (left to right) obviously enjoyed exploring the construction site as well!